A one-year subscription to your choice of Chirp Magazine (ages 3-6), Chickadee Magazine (ages 6-9) or OWL magazine (ages 9-13). Reading from a young age can inspire a kid's imagination, increase their vocabulary and make them speed readers in time for the next Olympics. Educate and entertain with today's WagJags. 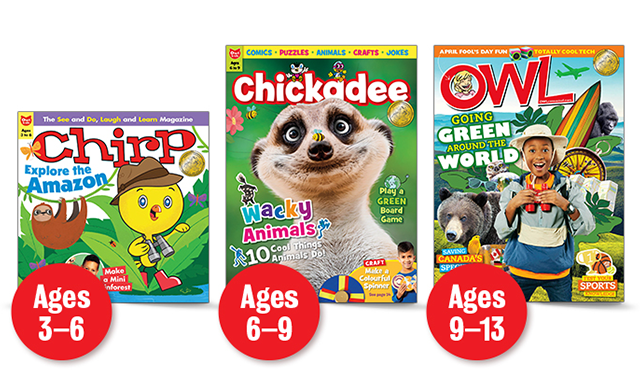 Made for kids who love to learn, Owlkids lineup of kid-and parent-approved magazines come packed with fun, entertaining and educational content 10 times a year. Chirp, made for kids ages 3 to 6, offers pages of stories, puzzles, illustrations and colourful photographs produced by some of Canada's most talented authors and artists. Chickadee is a fun, hands-on magazine for kids ages 6 to 9 whose thirst for knowledge and appetite for humour are insatiable. In each issue of chickadee, interactive stories, puzzles, comics, animal features, and science experiments educate and entertain readers. For big kids, ages 9 to 13, OWL provides its readers with timely, reliable and relevant information on everything from technology, sports and the environment, to pop culture and peer relationships. OWL is packed with lively text, bold designs, and tons of fun with original comics, quirky facts, and mindboggling puzzles designed to nurture a lifelong love of reading. Bonus! OWL subscriptions include OWLconnected eMag, the new interactive current affairs eMag delivered bi-weekly right to your child's inbox! With intuitive touch navigation, your kids can access news of the week, in-depth features, exciting sports and entertainment reports, interactive quizzes and much more. OWL and OWLconnected eMag offers the perfect mix of print and digital.